A meet and greet with state legislators and legislative candidates. Discuss the challenges you face as a nurse with legislators and candidates in small roundtable groups at this popular event. Afterward, enjoy a catered banquet featuring comedian and entertainer Kermet Apio, winner of The Great American Comedy Festival. How to make the 2017 Staffing Law work for you in your facility. Learn more about what types of violence nurses face and how you can help create a safer work environment in your facility. The movement to silence your voice and how you can stop it. Our discussions will include education, strategy discussions and networking with other RNs in your community. You will walk away with tools to make a difference and earn 6 CNEs. The Washington State Nurses Association is an approved provider of continuing nursing education by the Ohio Nurses Association an accredited approver of continuing nursing education by the American Nurses Credentialing Centerâ&#x20AC;&#x2122;s Commission on Accreditation. (OBN-001-91) (OH-231, 5/1/2019). Skagit Casino, Mt. Vernon * The Union Leadership Summit is designed for and limited to WSNA union-represented nurses. Nurses covered by a WSNA union contract who are not yet full dues-paying members will be charged a fee of $20 upon registration. Join us! Register at wsna.org/leadership. DR. PHYLLIS KRITEK, A WORLD RENOWNED EXPERT ON CONFLICT RESOLUTION AND HEALING AND NURSE STEPHANIE STAPLES ON BRINGING YOUR “A” GAME TO WORK AND LIFE AND FINDING RESILIENCY, AND OTHERS! PLUS, NETWORKING, LEGISLATIVE UPDATES AND MORE! JOIN US AT TULALIP ON MAY 1–3, 2019. VISIT RNCONVENTION.ORG FOR MORE INFORMATION. Bright Now! Dental and WSNA are pleased to be partnering together to offer WSNA members and their families exclusive savings for dental care. This is not an insurance plan, and participation is voluntary. You save and it works whether you have dental benefits or not! 3330 - Root Canal (Molar 3-canals) By General Dentist. If Specialist is necessary fees will vary. *Source: 2018 Fair Health Data. Exclusions may include and are not limited to implants, implant crowns, crowns with gold, and crowns/onlays/inlays that are all porcelain. Fees will vary for specialty services. Members covered under a DHMO plan such as Willamette Dental do not qualify for these discounts. 1. Cash patients only. Contact your Account Representative, Carrie Magnuson | Carrie.Magnuson@BrightNow.com | 253.405.4547 Nurani, P.C., Ashifa Nurani, DDS, Pearson, P.C., Jeffrey Pearson, DMD. ©2018 Smile Brands Inc. All rights reserved. ‘The Washington Nurse’ (ISSN# 0734-5666) newsmagazine is published by the Washington State Nurses Association. It is distributed as a benefit of membership to all WSNA members. A member subscription rate of $10 per year is included in WSNA membership dues. The institutional subscription rate is $30 per year (Canada/Mexico: US$36 per year; foreign: US$49 per year). The information in this magazine is for the benefit of WSNA members. WSNA is a multipurpose, multifaceted organization. ‘The Washington Nurse’ provides a forum for members of all specialties and interests to express their opinions. Opinions expressed in the magazine are the responsibility of the authors and do not necessarily reflect the opinions of the officers or membership of WSNA, unless so stated. Copyright 2018, WSNA. No part of this publication may be reproduced without permission. Information on advertising rates may be obtained from the WSNA website or by contacting Martin Hsiung at 206-575-7979. Advertising is accepted on a first-come, first-served basis for preferred positions, depending on space availability. WSNA reserves the right to reject advertising. Paid advertisements in ‘The Washington Nurse’ do not necessarily reflect the endorsement of the WSNA members, staff or organization. CONTRIBUTOR GUIDELINES WSNA welcomes the submission of manuscripts and artwork. Please contact Ruth Schubert by email at rschubert@wsna.org with submissions, article ideas or further questions. It is not the policy of WSNA to pay for articles or artwork. Currently, we have some very active District Nurses Associations that have been successful in engaging many WSNA members from all practice settings to address issues important to their membership. A few examples: •	Work with nursing students and schools of nursing. •	Developing relationships with community partners to work with the homeless population, set up and staff free clinics for low income populations. •	Providing quality continuing education for members. discussion and some outreach has begun. Upon completion of this project, the King County Nurses Association (KCNA) will be the only District Nurses Association that will retain its current boundaries. Organizational affiliates WSNA has bylaw language that allows for Organizational Affiliate membership in WSNA. Speciality Nursing Organizations or other Nursing Organizations that have a mission and purpose harmonious with WSNA are eligible. Each Organizational Affiliate will have a seat on our Practice Council as well as a voting seat in our Biennial General Assembly. Other needs specific to the organization will be discussed and considered. School Nurses of Washington State (SNOW) has made the decision to become WSNA’s first Organizational Affiliate effective August 2018. We are pleased and excited about this opportunity to add these organizations and their voice to our Practice and Legislative agendas. The work to consolidate District Nurses Associations into Regions and implementation of Organizational Affiliate membership will provide opportunities for registered nurses in Washington state to strengthen the collective voice of nurses as they advocate for nursing practice, patient safety and the wellbeing of their communities. My hope is that the Region/District Nurses Associations and the WSNA Organizational Affiliate members will come together and be seated together at the WSNA General Assembly meeting, which will take place at the upcoming Washington State Nurses Convention in May 2019, so they can join WSNA members in meeting the candidates running for WSNA leadership positions and be a voice to set the priorities that WSNA will address over the next biennium. For the most current nursing news and information, visit wsna.org/news. This year’s clinic is held one month earlier! 2018 Seattle/King County Clinic volunteer opportunity On Sept. 20–23, the 2018 Seattle/King County Clinic volunteer event will be held in the KeyArena at Seattle Center. Volunteer and join more than 100 partner organizations to offer free dental, vision and medical care to underserved and vulnerable populations. Each day, the Clinic needs over 750 healthcare professionals and general support volunteers to operate. The Clinic provides most equipment and supplies, as well as free meals and parking. WSNA is proud to partner with the Seattle/King County Clinic on this opportunity to produce and advance a free large-scale health clinic. Your support and participation are what make this community project a success. Above: Senator Maria Cantwell (center), with WSNA members and staff (left to right) Judi Lyons, Jan Bussert, Sally Watkins, Sydne James, Justin Gill and Anita Stull on June 21, 2018. WSNA members join ANA’s Hill Day in D.C. WSNA’s delegation to ANA’s Membership Assembly joined 274 nurse-advocates at the nation’s capital on June 21 to speak up for nurses and our patients. WSNA’s contingent spoke in person to Senator Maria Cantwell, Rep. Dan Newhouse and Rep. Derek Kilmer, as well as staff in other congressional offices. ANA participants in Hill Day included representatives from 45 states and all types of nursing professionals. Nearly every congressional office heard from an ANA advocate as members delivered 3,731 letters supporting an opioid response plan that would include nurses, as well as safe staffing legislation. In a big legislative win, the day following Hill Day, the U.S. House of Representatives overwhelmingly passed H.R. 6, a comprehensive opioid response plan that will equip another 170,000 nurses to help fight the opioid epidemic. Are you, or a colleague, working in long-term care? WSNA Finance Committee meeting For more information and a complete and up-to-date listing of events, visit wsna.org/calendar. Help WSNA build new bridges. We are expanding our reach to RNs who work in community-based and longterm care settings. A newly-implemented task force will focus on improving quality of care and increasing appreciation and understanding of the role of community-based and long-term care nursing. We are reaching out to nurses with a special interest in bridging the gap. This is vitally important, as the issues of providing safe care in these settings is becoming more serious. Please consider providing your expertise by joining the task force. Contact 206-575-7979, ext. 0. NEWS BRIEFS Washington Nurses to be recognized by NCSBN On Aug. 15 to 17, three Washington nurses will be honored by the National Council of State Boards of Nursing at its annual awards ceremony. Washington’s Lois Hoell, MS, MBA, RN, commission member, Washington State Nursing Care Quality Assurance Commission, and Suellyn Masek, MSN, RN, CNOR, commission member, Washington State Nursing Care Quality Assurance Commission will each receive the Exceptional Contribution Award for their significant contribution and demonstrated support of NCSBN’s mission. A Service award will be given to Paula Meyer, MSN, RN, FRE, executive director, Washington State Nursing Care Quality Assurance Commission, for her work as an executive officer of the boards of nursing (BONs) for the past 20 years. Congratulations to our Washington nurses for the recognition! Nurses across the state celebrated National Nurses Week May 6 through 12. ANA’s theme for this year was “Nurses: Inspire, Innovate, Influence.” Thank you for sharing photos of your celebration! NCSBN will be recognizing other recipients for the Exceptional Contribution Award including: •	Gloria Damgaard, MS, RN, FRE, executive director, South Dakota Board of Nursing, will be honored with the R. Louise McManus Award for sustained and significant. •	Gregory Y. Harris, JD, former board member, Arizona State Board of Nursing, and South Dakota State Senator Deb Soholt, MS, RN, former board member, South Dakota Board of Nursing, will each receive the Distinguished Achievement Award. Above and right: Kadlec Regional Medical Center nurses gathered for a wellattended breakfast, May 8, 2018. •	The College of Nurses of Ontario will be awarded the Regulatory Achievement Award, for an identifiable, significant contribution to the mission and vision of NCSBN in promoting public policy related to the safe and effective practice of nursing in the interest of public welfare. Above: WSNA Nurse Representative Carmen Garrison with Kay Langevin, who has for several years been the driving force behind Kadlec’s annual Nurses Week breakfast. Above and right: Seattle / King County Health Department nurses enjoyed a dinner at The Old Spaghetti Factory in Tukwila. Above: RNs at King County Correctional Facility in downtown Seattle. Above: Whatcom County Health Department nurses. Above: Seattle Children’s Hospital nurses enjoy a dinner at Ray’s Boathouse, in Seattle, May 7, 2018. WSNA joins nationwide condemnation of Supreme Court decision in Janus case On Wednesday, June 27, the U.S. Supreme Court issued a 5-4 decision in Janus v. AFSCME  holding that the collection of “fair share” or agency fees is unconstitutional under the First Amendment. roud WSNA union members joined our labor brothers and sisters across the nation to condemn the decision, which ruled against working people and in favor of billionaire CEOs and corporate interests. 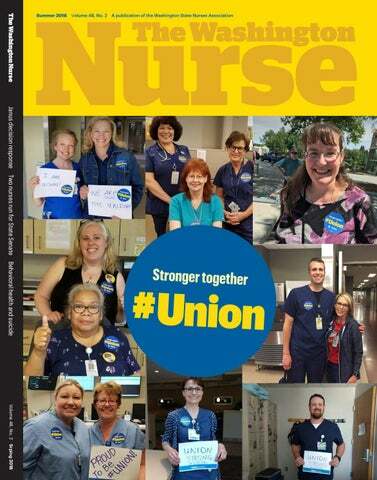 WSNA nurses showed up at rallies in Seattle, Spokane and Vancouver, and in our facilities across the state, nurses wore stickers and held signs proclaiming their commitment to stick with our union. WSNA released a statement on the day of the decision, which said: We strongly condemn the U.S. Supreme Court’s decision to overturn 40 years’ worth of precedent in the Janus v. AFSCME case by making fair share fees for public sector employees unconstitutional. Today, the Supreme Court ruled against working people and in favor of billionaire CEOs and corporate interests. Nurses and other working people will continue to organize for a fair deal on the job that allows us to negotiate with management for good wages, decent benefits and safe working conditions. We will continue to stand up for the needs of our patients and our ability to give them the best care. Standing together, nurses have achieved remarkable victories that lead to safer patient care. We have successfully fought for safer nurse staffing, rest and meal breaks that allow nurses to step away from the stress and responsibility of providing care, and greater workplace safety. We won’t allow a court decision to stand in the way of our fight for our profession, our patients and our communities. Read more about how WSNA members are standing union strong at wsna.org/union-strong. It is more important than ever that we stand together to negotiate strong contracts that support our ability to give our patients and communities the best care. We all have a voice, and we all have a part to play. Want to get involved? Contact your Nurse Representative or WSNA’s Director of Organizing, Tara Goode, at tgood@wsna.org. The power of one UWMC nurses, union partners and concerned community members rallied in support of the UWMC psych ward, May 9, 2018. Putting the 2017 Safe Staffing Safe staffing is the number one priority for our nurses and is critical to safe and quality patient care in our hospitals. WSNA is committed to supporting nurses on staffing committees and ensuring the 2017 Nurse Staffing Law (Patient Safety Act, HB 1714) is effectively implemented across Washington. This law: •	Creates greater transparency on hospital staffing plans. •	Increases accountability in the implementation of staffing plans. •	Strengthens and empowers nurse staffing committees. In early 2018, WSNA joined with the Washington State Hospital Association, SEIU 1199NW and UFCW 21 to form the Nurse Staffing Coalition, with the aim of supporting implementation of the Nurse Staffing Law. The coalition has created a tool kit with information, recommendations, draft forms and work samples to support the work of nurse staffing committees across Washington. You will find the tool kit on our website at wsna.org/nursing-practice/safe-nurse-staffing/toolkit. Full text of the final bill as signed into law. Key elements of nurse staffing committees under the 2017 law, including composition, primary responsibilities, staffing plan development and implementation of the plan. We recommend that all hospitals have a Nurse Staffing Committee charter describing the roles, responsibilities and processes by which nurse staffing plans are developed and used. Core elements of the nurse staffing plan (matrix by unit and shift) recommended for submission to the Department of Health beginning January 1, 2019. To be signed by hospital CEO attesting that the staffing plan submitted to the Department of Health was developed in accordance with the law. The 2017 Staffing Law includes a process for staff nurses to raise staffing-related complaints. Our recommended complaint form will help track complaints and data coming to the nurse staffing committee. Tool to help nurse staffing committees assess and evaluate complaints, including a decision tree outlining the process. As we move forward, WSNA will continue to provide training and support for our members on nurse staffing committees. Excel form to help the nurse staffing committee track complaints, the resolution and the time frame by which complaints were received and resolved. If you have questions, please contact Anne Tan Piazza, WSNA Senior Director of Strategic Initiatives, at apiazza@wsna.org or by calling 206-575-7979. Law into action Nurse Staffing Committee (NSC) Checklist NSC composition and participation oo At least 50% are staff nurses (RNs providing direct patient care). oo Staff nurses on the NSC are selected by the union if RNs represented by union. oo Participation on NSC shall be scheduled work time, relieved of all other work duties, and paid. oo No retaliation or intimidation of employees serving on NSC or reporting concerns to NSC. NSC primary responsibilities oo Development & oversight of annual patient care unit & shift staffing plan based on patient care needs. oo Semiannual review of staffing plan against patient need & evidenced-based info (nursing sensitive indicators). oo Review, assess, and respond to staffing variations/ concerns/complaints reported to the NSC. oo Track complaints reported to the NSC. oo Track resolution of each complaint by NSC (resolved, dismissed, unresolved). Staffing plan posting, disclosure, implementation and complaint Posting oo Posting of nurse staffing plan and actual staffing levels (nurses and relevant clinical staff) for that shift in public area on each patient care unit. oo Plan approval and implementation oo CEO provide written explanation if staffing plan from NSC is not adopted, and prepare alternate staffing plan. oo Hospital must implement staffing plan (either original NSC plan or alternative by CEO) and assign nursing personnel to each unit according to plan beginning January 1, 2019.
oo Census, including total number of patients on unit/shift including discharges, admissions, and transfers. oo Level of intensity of all patients and nature of care delivered on each shift. oo Skill mix. oo Level of experience and specialty certification or training. oo Need for specialized or intensive equipment. oo Layout of patient care unit including placement of patient rooms, treatment areas, nursing stations, medication prep areas, and equipment. oo Staffing guidelines adopted by national nursing profession and specialty nursing organizations. oo Availability of other personnel supporting nursing services. oo Strategies to enable nurses to take meal and rest breaks. ith behavioral health issues (mental health and sub- ers to basic services and treatment for mental health disorders. stance use disorders) and suicide prominently posi- Education and increased individual and public dialogue are key tioned in the local and national news headlines nearly to continuing to diminish and hopefully, one day, erase societal daily, we are called to action as nurses but often feel stigma, allowing people to obtain the help they need so more overwhelmed and disoriented by the depth and breadth lives can be saved. of the problem. Understanding the prevalence and pervasiveness There are many examples in health care, such as cardiovascuof behavioral health issues and who can be afflicted is often the lar disease (heart disease) and acute myocardial infarction (heart first step in defining a strategic approach. attack), that illustrate the benefit of immediacy in response by Nearly 45 million people in the U.S. (4.2 percent of the popu- the community and health care professionals. This facilitates the lation) suffer from mental illness and at least 10 million of these successful delivery of appropriate and timely care, and quality people suffer from serious mental illness. It is reported that in 2016 outcomes. However, this attention and immediacy of care – and less than half (43.1 percent) of those suffering received mental allocation of resources – isn’t always available with behavioral health treatment and nearly 45,000 lost their lives to suicide — health issues because of the associated stigma and failure to idenfar more than the 19,362 who were victims of homicide in this tify the presence of illness, and due to the significant challenges country (The National Institute of Mental Health, 2018a, 2018b). in access to care and availability of resources. Access is defined Suicide rates have steadily climbed, by 28 percent, since 1999, and measured by geographic proximity and time it takes to get with Washington state carrying a relatively high suicide rate at to help, ability to secure a health care provider who is qualified 12.58-14.23 deaths per 100,000 compared with other states that to diagnose and treat the condition, existence of adequate funding (usually insurance coverage) are as low as 6.19-11.40 per 100,000. Women are more likely to seek help than men, and men are four times more likely to take and access to a residential (inpatient) facility when needed. their own lives than women (Regge, 2017). Both inpatient and outpatient behavioral health care are often Why do so many people need to unnecessarily suffer and die insufficiently reimbursed. This financial caveat is a crucial considfrom these treatable diseases, and how do we get them the ser- eration in designing successful pathways for accessing behavioral vices they need? Stigma is at the helm of this problem and can health services (National Council for Behavioral Health, 2017). be a barrier to seeking help. This stigma can also contribute to Too often, the very people who are suffering from these disabling alienation from others who don’t understand the disease or how diseases are those who have significant barriers to care due to to help (Mayo Clinic Staff, 2018). Despite Washington’s robust financial constraints and limited social resources. Until behavioral mental health parity law (Washington State Legislature, 2010), health care is appropriately valued in our health care system, these struggles continue with health insurers who can create barri- problems will persist. MANDATORY SUICIDE PREVENTION COURSE FOR NURSES A six-hour suicide prevention course is required of all actively licensed nurses in Washington state. To meet this need, the Washington State Nurses Association and University of Washington will be co-sponsoring an accredited Suicide Prevention course at the next Washington State Nurses Convention, 2019 at Tulalip Conference Center on May 3, 2019. •	Provides an e-notification when you are due to renew any nursing licenses you hold and provides a central place to review your license(s). •	Collects demographic data via Nursys for the purposes of national and state workforce tracking. As the comprehensive source of nursing licensure statistics for the U.S. and territories, the NCSBN collects demographic data via Nursys for the purposes of national workforce tracking. The demographic/national workforce tracking data that you will be asked at the time of enrollment in Nursys is: Gender, race/ethnicity, primary zip code, membership status of a collective bargaining unit, language(s) spoken fluently, nursing degree at time of initial licensure, nursing school attended and year of graduation, all nursing related degrees and credentials, which country originally licensed in, year of initial nursing license, active status as an Advanced Practice Nurse (APN), which states licensed as an APN, employment status as a nurse and typical hours worked. The NCSBN is a strong resource for nurses. For more information about Nursys and other topics, please visit www.ncsbn.org/nursys. The National Council of State Boards of Nursing (NCSBN) is a national, not-for-profit organization comprised of boards of nursing from 50 states and the District of Columbia; Washington state’s Board of Nursing (the Nursing Care Quality Assurance Commission – NCQAC) is an active member of the NCSBN. The NCSBN and NCQAC exist to protect the public’s health and welfare by assuring that safe and competent nursing care is provided by licensed nurses. As the comprehensive source of nursing licensure statistics for the U.S. and in order to track nursing as a workforce, NCSBN is partnering with their member state Boards of Nursing, including Washington state, to collect demographic data that pertains to licensed registered nurses. Beginning January 1, 2018, NCQAC requires all nurses enroll with Nursys at the time of application for a new nursing license or licensure renewal. Maintaining information on the current and projected supply and demand of nurses through the collection and analysis of data is a fundamental part of what the Washington Center for Nursing does. We recently conducted three surveys to learn more about promoting diversity in the profession, transition-topractice programs and nursing faculty in our state. The findings will inform the work of WCN and our coalitions. After collecting input from 295 nursing students at the 2016 Nursing Students of Washington State Convention and online on their experiences with diversity and inclusion in nursing education, the Washington Center for Nursing, with input from a broad stakeholder group, has put forth recommendations for strategies that promote recruitment, retention, graduation and leadership development of future diverse students from underrepresented groups. One key factor from the survey: Promoting outreach and recruitment to families of underrepresented students is one of the key strategies for making nursing more inclusive. Read the full report and recommendations at wsna.to/WCNdiversity. their job satisfaction, plans for the future and other important factors that impact the future of the RN workforce. › Nurse educators enjoy professional satisfaction. Most survey respondents are highly satisfied or satisfied with being a nurse educator, especially when it comes to relationships with students, colleagues, management and professional autonomy. › However, income and workload are the top dissatisfiers among nurse educators. Faculty work an average of 50 hours per week when school is in session and 20 hours per week when school is not in session. Nurse faculty employment contracts are limited to when school is in session. As competition increases for nursing services across health care sectors, if noncompetitive compensation and concerns about workload continue, this will create challenges in recruiting and retaining future nurse educators. Be prepared for the unexpected. Get a WSNA emergency preparedness kit. WSNA nurses run for State Senate Nurses make outstanding elected officials – bringing a deep knowledge of the health care system, excellent critical thinking skills and a strong ability to build relationships. That is why WSNA is always excited when members step up to run for office at any level. This year, we are proud to support two WSNA members running for office in the 34th legislative district, which covers West Seattle, Vashon Island and Burien. Both Sofia Aragon and Lois Schipper are running for the open Senate seat, currently held by Senate Majority Leader Sharon Nelson. “As Senator for the 34th, my goal is to put my “As a nurse, I have dedicated my 30-year nursing experience to work and hit the ground running career to helping families and children live to advocate for fulling funding quality educabetter lives. I want to bring my experience as tion, assuring affordable housing for all famia public health and children’s health expert to the State Senate in Olympia to inform the dislies, and making sure quality health care is cussion about what we can do as a state to make things better for available for everyone.” Sofia Aragon serves as the Executive Director of the Wash- our children, our families and our community.” ington Center for Nursing (WCN), an organization established Lois Schipper has spent the majority of her 30-year career by WSNA and other leading nursing organizations to address working in Public Health and Community Health Care, in both the nursing shortage. Prior to joining WCN, Aragon was a senior direct service and leadership roles. Much of her work has focused governmental affairs advisor at the Washington State Nurses Asso- on underserved and low-income women and their children. While ciation. Aragon also spent a number of years at the Washington working for Public Health – Seattle & King County, Schipper led State Department of Health, serving as the legislative and policy evidenced-based home visiting programs for pregnant women and manager for the Community and Family Health Division and as children, oversaw the Parent & Child Health Program and served the contracts manager with HIV Client Services. She has held as the administrator of the White Center Public Health Clinic. direct-care nursing positions with Providence Medical Center Schipper currently manages the Patient Navigation Program at and the Rainier Park Medical Clinic in Seattle. Seattle Children’s Hospital. This program is located in the Center Additionally, Aragon has served on Governor’s Commission for Diversity and Health Equity and helps non-English speakon Asian Pacific American Affairs, as president of the Washington ing families understand their child’s complex health condition chapter of the American Association of Nurse Attorneys, and is and partner with the medical team to support and optimize their a member of Filipino Lawyers of Washington. She is a current child’s health. board member of the Washington Low Income Housing Alliance. Additionally, Schipper has been active in her community, In 2014, Aragon was recognized as a “Heroine of Health Care” by serving as Diversity Chair for the 34th District Democrats and as the Center for Women & Democracy. PTSA Legislative Chair. She led the bond and levy committee for In 1975, Aragon immigrated to Seattle with her parents – her her local school district for almost a decade, successfully passing mother was one of the many hundreds of Filipino nurses recruited bonds and levies to support teachers and schools. A long-time member of WSNA, Schipper has served on negoto practice in the United States. Aragon credits her journey in nursing to her mother, and her journey in advocacy to her experi- tiating teams and previously served as the Chair for a bargainence as a registered nurse advocating for patients. The desire to ing unit. Until this Spring when she announced her Senate run, be a stronger patient advocate led her to pursue a law degree and Schipper also served as a member of the WSNA-Political Action Committee Board of Trustees. to engage in health policy at the state level. Schipper holds a Bachelor of Science in Nursing from Ohio Aragon is a graduate of Issaquah High School and earned a degree from the University of Washington and a Bachelor of State University and a Master’s in Public Health from the UniverScience in Nursing from Seattle University. She holds a law degree sity of Minnesota. She served in the Peace Corps in Mauritania, West Africa, where she worked with malnourished children as a from the Loyola University – Chicago School of Law. Maternal & Child Health Nurse. How do we decide? Decoding WSNA-PAC’s Endorsement Process By Chris Birchem, RN WSNA-PAC Board Chair Each election cycle, the Washington State Nurses Association Political Action Committee (WSNA-PAC) receives dozens of requests for endorsement. Why? Because candidates value the support of nurses, and WSNA-PAC’s endorsement sends a strong message to voters. WSNA-PAC supports candidates and incumbents who are strong on nursing and patient safety issues, regardless of political party affiliation. As nurses, we value transparency and integrity – and our endorsement process reflects that. Outreach to all candidates As part of a fair endorsement process, WSNA-PAC reaches out to all candidates who file with the Secretary of State to run for the state legislature or statewide office, such as Governor or Attorney General. Each candidate is emailed a candidate questionnaire, which he/she is invited to complete and send back to the WSNA-PAC Board. Not all candidates choose to respond to the WSNA-PAC, but all candidates are invited to participate in the endorsement process. The first step of WSNA-PAC’s endorsement process is the candidate questionnaire. Candidates receive a five-page document that outlines nursing policy and budget priorities, and asks candidates how they would address or vote on certain issues if elected. Each questionnaire that is returned to the WSNA-PAC Board is scored, and candidates are invited to interview. Candidates who choose to interview with WSNA-PAC Board members and nurses have an opportunity to engage in deeper conversation about their backgrounds, experiences and their priorities. These interviews also give candidates the opportunity to hear directly from nurses about the budget and policy issues that affect nurses and patients. WSNA-PAC Board members and nurses who participate in candidate interviews complete an evaluation of each candidate interview. Be the change you wish to see. Get up, get out, and GOTV! July 20 Primary Election ballots are mailed to registered voters. Attending a postcard party Write postcards to be mailed to other nurses, reminding them to vote for the pronurse candidates in their district. Last day for in-person registration in order to vote in the primary election. Phone banking Call other nurses – ask them if they received their postcard from WSNA and remind them to vote! Doorbelling Join other nurses in an afternoon of fun by canvassing a precinct in your area. Talk with voters at their door – nurses are the most trusted profession and voters appreciate hearing from you in person about WSNA-PAC endorsed candidates. There truly is so much at stake in the 2018 elections. Now more than ever, we need nurses to help get out the vote for uninterrupted meal and rest breaks, for closing the mandatory overtime loophole, for a reduction in workplace violence, for more accountability and transparency from health insurance companies, and for more support for people in our communities battling opioid addiction. Watch your email to be alerted to GOTV activities in your area, or contact Nathasja Skorupa to become more involved with your local pro-nurse candidates: nskorupa@wsna.org or 206-575-7979, ext. 3005. Not sure what legislative district you’re in? Just enter your address into app.leg.wa.gov/DistrictFinder. Have fun with other WSNA members while making a difference in our democracy! Oct. 8 General election deadline for voter registration, address change and other updates. Register to vote online at www.sos.wa.gov/elections/ myvote/olvr.html. Oct. 19 General election ballots are mailed to registered voters. Oct. 29 Last day for in-person registration in order to vote in the general election. Your support for tomorrow’s careers Your contributions to the Washington State Nurses Foundation support the academic advancement of outstanding nursing students pursuing Associate, Bachelors, Master’s and Doctoral degrees. Congratulations to the following students who have been awarded scholarships by the Washington State Nurses Foundation for the 2018-2019 academic year! New scholarships WSNF is proud to announce two new scholarships available for the 2019-20 academic year. These scholarships, made possible by the American Nurses Foundation, will be available for three years for a total of $6,000 in new scholarship funding to support registered nurse education. One of the scholarships is for an MSN, DNP or PhD student. The second is designated for a BSN, MSN, DNP or PhD student. These scholarships are awarded to applicants who demonstrate advocacy, leadership and excellence. Learn more about WSNF scholarship eligibility and application requirements at wsna.org/wsnf/scholarship. King County Nurses Association Nurses, nursing students come together for National Nurses Week More than 130 nurses, nursing students and others enjoyed the KCNA Annual Meeting and Spring Banquet on May 10 at the Ballard Bay Club. The sun came out in full, just in time to honor five Shining Star Award winners (all from Public Health - Seattle & King County this year) and 18 scholarship recipients. The silent and live auctions raised $13,000, all of which will go to the KCNA Scholarship Fund, making a total of $31,000 raised this year. Congratulations, 2018 Shining Star Award recipients Shining Star Awards honor exceptional nurses who are outstanding in their positions and/or in the community. Awardees are nominated by their peers and selected by the KCNA Membership/PR Committee. Zerai Asgedom, RN, BSN, MPH is nursing supervisor at Jail Health Services. He came to the U.S. from Ethiopia to attend college, with the hope of becoming a nurse. He worked to pay his tuition at Seattle Pacific University, and also was awarded a KCNA scholarship in 2006. After starting out at Swedish Medical Center, Zerai obtained his MPH (with an emphasis in global health.) Currently, he also works part-time in the Edmonds Community College LPN program and per diem for Swedish. Karen Brozovich, RN, MPH recently retired from her position in the Nurse Family Partnership at Public Health, an evidence-based home visit program that serves low-income women having their first babies. She is known for her attention to detail and gentle mentoring to attain the highest standards of nursing practice. A great advocate for those for whom English is a second language, Karen has written grants to help fill the gaps for Spanish-speaking families. She has been active with KCNA for many years, serving on the board of directors and Finance and Scholarship committees. Xochitl Chavez, RN began her career as a medical assistant, then obtained her LPN diploma and completed an LPN to RN program. Having earned her BSN at UW Bothell, Xochitl has been a clinic RN with the Public Health Clinic at NAVOS for two years. She is known as an impeccable nurse – thorough, compassionate, smart and efficient – who has helped the clinic reach a new level of proficiency. Zerai Asgedom receives KCNA's Shining Star Award, May 10, 2018. Jennifer Sarriugarte, RN, MN, CIC is infection preventionist at Public Health, a position that supports clinical practices in ambulatory care, Jail Health Services, TB Prevention and STD Clinics. Her position was the first of its kind, and Jennifer developed it from the ground up, bringing her laidback style and unassuming professionalism to her job. She has an MSN from Seattle University and brings her passion for social justice to her practice and as a leader in the Trauma Informed Systems Initiative. Lynn Tyner, RN, BSN has been care manager for the wellness integration team at NAVOS/Public Health for six years, where she is responsible for coordinating a group of clients with both serious mental health and medical issues. Her high-quality nursing and individual attention have made measurable differences in both work delivery and client wellbeing. Shining Star Award recipients Xochitl Chavez and Lynn Tyrner. Best wishes to our scholarship recipients — 18 in 2018 KCNA also presented scholarships of $3,000 each to 18 high achieving nursing students from King County. Their short biographies are available at www.kcnurses.org, “Scholarships.” The 2018 scholarship recipients are: Valerie Weiss Awards (pursuing advanced degrees): Mishele Bang, Seattle University; Prabina Dahal, University of Washington/ Bothell; Jingyi “Cindy” Dong, University of Washington; Lindsey Foley, University of Washington; Jane Kim, University of Washington; Marit Knutson, Seattle Pacific University; Katelyn Powell, University of Washington; Kathryn Stanley, Seattle University. Graduate Entry Awards: Bridgett Chandler, Seattle University; Carolyn Wortham, Seattle University. Basic Awards (pursuing initial licensure as RNs): Habibo Bario, University of Washington; Joshua Carter, Shoreline Community College; Sophia Cima, Seattle University; Danica Kleweno, Shoreline Community College; Amanda Kovecs, Seattle University; Brooklyn Leick, Seattle University; Nina Mei, Seattle University; Maria Salguero, Seattle Pacific University. KCNA offers special thanks to Salal Credit Union, which generously sponsored four scholarships this year. KCNA holds annual elections Newly elected board members include: Officers: Pamela Newsom, Vice President; Pauline Lao, Secretary. Members at Large: Brenda Balogh; Carolyn Clark; Jane Kim; Darlene Von Lehman; Rosa Young. Nominating Committee members: Edna Cortez; Chris Henshaw; Erin Michonski. PCNA nurse of the year, Judy Newville, with friends and coworkers, May 11, 2018. Pierce County Nurses Association On Friday, May 11, PCNA celebrated Nurses Week with our annual Nurses Week Annual Meeting, Silent Auction and Banquet of Laughter. This laughter-filled event included entertainment by hypnotist Michael Cain, fundraising activities that raised over $3,800 for nursing scholarships and, most importantly, a celebration of Pierce County nurses. We honored our 2018 Nurse of the Year, Judy Newville! Judy was nominated for her wonderful clinical and bedside skills as well as her work as a preceptor. She’s precepted over 50 nurses in the last ten years. Judy feels that it’s “something that comes natural to me... I love watching the progression of new nurses.” She enjoys helping them find their way from a nervous new graduate to a confident and safe practicing nurse. We also recognized our 2018 scholarship winners. This spring PCNA awarded eight scholarships to nursing students who demonstrated academic excellence, community involvement and a passion for nursing. We are very excited to be supporting the next generation of nurses! July marks the beginning of a new fiscal year for PCNA. We’re looking forward to a year filled with community outreach through career fairs and meeting with nursing students, fundraising for nursing scholarships and providing educational opportunities for nurses. We invite you to join us! Email us at office@piercecountynurses.com to be added to our contact lists. Please dave the date for upcoming PCNA events: Saturday, Oct. 20, 2018 – Fall Education Event Saturday, Feb. 23, 2019 – PCNA Bowling Tournament Saturday, March 30, 2019 – PCNA Spring Education Event Friday, May 10, 2019 – PCNA Nurses Week Banquet! To stay up to date on all our activities, we invite you to visit our website at www.piercecountynurses.com and to Like us on Facebook at www.facebook.com/piercecountynurses. How are WSNA membership dues rates calculated? Please complete a Change of Information Form or email your changes to membership@wsna.org. The Change of Information Form is available on the WSNA website under “Membership,” or you can contact the WSNA Membership Department at 800-231-8482 or 206-575-7979 to request one. The rates for Washington State Nurses Association (WSNA) membership dues are determined by three factors. The first factor is the district where the member is employed. A member may find the district that they are employed in by reviewing the membership application. The second factor is the total number of hours a member is scheduled to work per month (FTE). Of note, this is the total hours per month and not the total hours per pay period. The final factor is whether or not the member is covered by a WSNA collective bargaining contract. The answer as to who is covered in the bargaining unit at a facility can be found in the collective bargaining contract. The application as well as the collective bargaining contracts may be found on the WSNA website. A change in FTE or in employment status in the collective bargaining unit may affect the rate of WSNA membership dues. Please contact the membership department to advise of any change in FTE or employment status so that the dues rate (if necessary) may be adjusted accordingly. If unsure about a dues rate, please review the membership application for 2018. The membership application is available at wsna.org/membership/application. Please feel free to contact the membership department for any questions related to dues amounts or dues payment by phone at 206-575-7979 or by email at membership@wsna.org. Please note: It is the member’s responsibility to notify WSNA in writing of any changes in address, employer, FTE status, layoff or leave of absence. Write to: Membership – Washington State Nurses Association, 575 Andover Park West, Suite 101, Seattle, WA 98188. Notice of Washington State Nurses Association policy regarding nonmembers employed under WSNA collective bargaining agreements Federal and state labor laws recognize the right of unions in Washington to enter into collective bargaining agreements with employers that require employees, as a condition of employment, either to join the union (and thereby enjoy all of full rights and benefits of membership) or to pay fees to the union (and thereby satisfy a financial obligation to the union without enjoying the full rights and benefits of union membership). 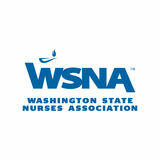 Regardless of the wording of the “union security” agreement, employees represented by the Washington State Nurses Association for purposes of collective bargaining and covered by a union security agreement are not required to become full members of WSNA, and are required only to choose either to be members of WSNA or pay fees to it. Employees who choose to become members of the Washington State Nurses Association pay WSNA dues and receive all of the rights and benefits of WSNA membership. Employees who either decline to become members of WSNA or who resign from WSNA membership may pay “agency fees” to cover their share of the cost of representation, and thereby satisfy any applicable union security obligation. WSNA has negotiated union security agreements, which have been ratified by the democratic vote of the affected employees and which require that all employees must either join the union or pay fees to the union, in order to ensure that each employee who is represented by WSNA pays a fair share of the cost of that representation. Such union security agreements strengthen WSNA’s ability to represent employees effectively in collective bargaining, contract enforcement and grievance administration, while eliminating “free riders” who enjoy the benefits of a WSNA contract and representation without contributing their fair share of the union’s expenses for negotiating, administering and enforcing the contract. Through the collective bargaining process, nurses represented by WSNA achieve higher wages, better benefits, fairness in the disciplinary procedure, and enhanced respect for their skills and professionalism. These improvements, won through collective bargaining, enhance the terms and conditions of working life for all employees, and allow them to better provide for themselves and their families. Only WSNA members enjoy all of the full rights of WSNA membership. Only WSNA members have the right to attend local unit meetings and speak out on any and all issues affecting their workplace, WSNA and its members; the right to participate in the formulation of WSNA policies; the right to have input into WSNA bargaining goals and objectives, and to serve on WSNA negotiating committees; the right to nominate and vote for candidates for WSNA office, and to run as a candidate for WSNA office; the right to vote on contract ratification and strike authorization; the right to participate in the WSNA general assembly; and the right to participate in the American Nurses Association and the American Federation of Teachers. Agency fee payers are those who choose not to be full members of WSNA but who pay their share of WSNA’s expenses for negotiating, administering and enforcing the contract with their employer by payment of agency fees. They thereby fulfill any applicable union security financial obligation to WSNA under the terms of any collective bargaining agreement between their employer and WSNA. Agency fee payers forfeit valuable rights and benefits of WSNA membership. Agency fee payers give up their rights to have input into the affairs of WSNA, the organization that represents them in dealings with their employer concerning wages, hours of work, health and retirement benefits, disciplinary matters, and other terms and conditions of employment. Any WSNA member who chooses to become an agency fee payer (and thereby forfeit his or her WSNA membership rights) may resign at any time from WSNA by submitting a written notice of resignation from WSNA membership, which becomes effective upon receipt by WSNA. Agency fee payers should submit to WSNA an Agency Fee Payer Application Form, which is available upon request from WSNA. Agency fee payers are required to pay fees equal to their share of WSNA costs germane to collective bargaining, contract administration and grievance adjustment. WSNA automatically reduces the fee charged to agency fee payers by the amount attributable to expenditures incurred for WSNA activities that are not related to its responsibilities as representative for purposes of collective bargaining. In our most recent accounting year, 6.6% of WSNA’s total expenditures were spent on activities unrelated to collective bargaining representation. Any non-member who is financially obligated to WSNA under a union security agreement may inspect the audit report of WSNA expenditures at a reasonable time and place upon written request to WSNA. Any non-member who disagrees with the amount of the agency fee may file a written challenge with WSNA, which must state the basis for the challenge. For members who resign their membership during the calendar year, challenges must be made within 30 days of the postmark of the notice regarding their change in status from members to agency fee payers. For non-members, challenges must be made during the 30 day period after the postmark of WSNA’s written notice of the new calculation for agency fees that take effect on Jan. 1 of each year. Such challenges shall be decided by an impartial arbitrator appointed by the American Arbitration Association pursuant to its Rules for Impartial Determination of Union Fees. Any challenges must be submitted to WSNA, ATTN: Agency Fee Challenges, 575 Andover Park West, Suite 101, Seattle, WA 98188. It is recommended that any challenges submitted be sent by certified mail, but certified mail is not required. Are you under investigation from the Department of Health or have you been served with a Statement of Charges and face an administrative hearing? Protect your professional license and livelihood by calling the Rosenberg Law Group: we handle all components of your professional licensure defense before a Washington State agency or board. We have a proven track record of successfully defending professional licenses.